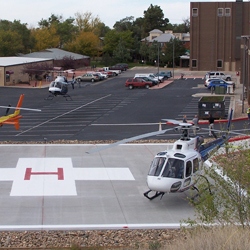 Arkansas Valley Regional Medical Center is a Critical Access Hospital and is located on two blocks of land. The main building is licensed to house 25 acute care patients. The 129,300 (76,500 plus 52,800 new) square-foot main building began operations in 1971. AVRMC has continued to improve the facilities and upgrade its equipment through funds generated from Medical Center operations. AVRMC operates a nursing home located on the Medical Center's campus that is known as the Nursing Care Center. The facility offers both semi-private and private rooms. The total number of licensed beds is 30. AVRMC is accredited by The Joint Commission. Joint Commission accreditation is recognized nationwide as a symbol of quality that reflects an organization's commitment to meeting certain performance standards. To earn and maintain The Joint Commission's Gold Seal of Approval, an organization must undergo an on-site survey by a Joint Comission survey team at least every three years. If you, as a patient, have any concerns about patient care and safety in the hospital, that the hospital has not addressed, please contact our Administration at (719) 383-6001. If the concerns cannot be resolved through Administration, you are encouraged to contact The Joint Commission. You may contact The Joint Commission's Office of Quality Monitoring to report any concerns or register complaints by either calling (800) 994-6610 or emailing complaint@jcaho.org.